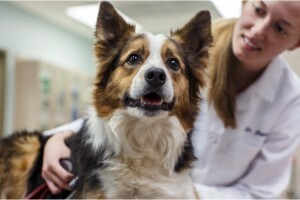 Zoetis (NYSE: ZTS), a maker of animal health medicines and vaccines, announced this week that it has received a conditional license from the U.S. Department of Agriculture (USDA) for its immunotherapeutic to treat canine atopic dermatitis, an allergic skin condition in dogs. The company, which bases its research and development operations in Kalamazoo, MI, says its drug is a first-of-its-kind antibody therapy to help reduce the itching associated with canine atopic dermatitis. In dogs, itching is caused by an inflammatory process that is perceived through the brain, Brown said. Scratching is triggered by both the inflammatory response and neurologic recognition. Because of that connection, Zoetis’s therapy contains an antibody that specifically targets and neutralizes interleukin-31 (IL-31), a key protein responsible for sending itch signals to the brain. The drug is administered through a monthly injection. The traditional treatment for canine atopic dermatitis is a course of corticosteroids, but that comes with side effects, Brown said. Another option is daily cyclosporine capsules, but they can only be used on dogs that are at least six weeks old and weigh at least nine pounds. “With our therapy, the response is targeted and the side effects are much more limited,” he added. Zoetis was Pfizer’s animal health division until it was spun out into an independent company after a 2013 public stock offering. The company’s commercial headquarters are in Florham Park, NJ, but it has roughly 700 employees and a manufacturing plant in the Kalamazoo area. In total, Zoetis has 10,000 employees worldwide and expects to haul in about $4.7 billion in revenues this year. Brown said Zoetis established a leadership role in veterinary dermatology through the 2014 launch of Apoquel, a daily oral medication for itchy dogs. (Apoquel blocks the function of proteins involved in itch and inflammation; the new immunotherapeutic targets and neutralizes the IL-31 protein, not allowing it to bind to its receptor.) Though Brown said the new antibody therapy is the first of its kind in dermatology, he thinks it will soon set the standard for future treatments. Zoetis will continue working with the USDA to obtain full licensure, and Brown said he expects the antibody therapy will be in the hands of doctors by the end of this year. “We’ll provide top-flight technical support to veterinarians so they can understand and use our product wisely,” he said.